French novelist; born in Paris April 2, 1840; died there Sept. 29, 1902. 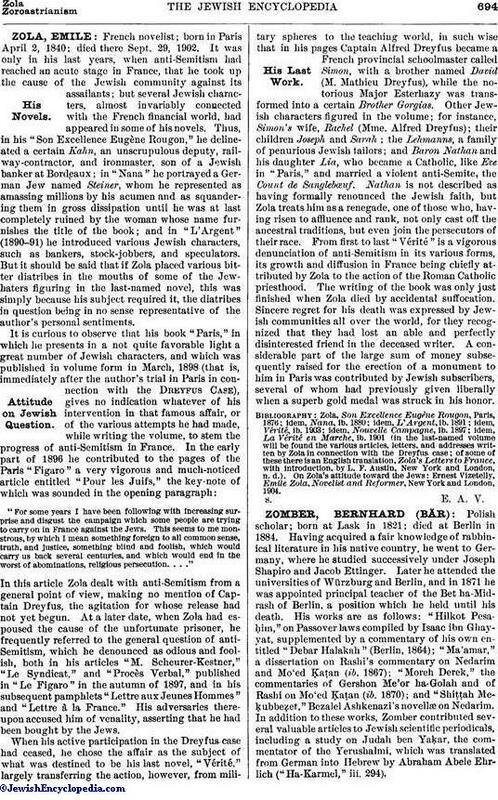 It was only in his last years, when anti-Semitism had reached an acute stage in France, that he took up the cause of the Jewish community against its assailants; but several Jewish characters, almost invariably connected with the French financial world, had appeared in some of his novels. Thus, in his "Son Excellence Eugène Rougon," he delineated a certain Kahn, an unscrupulous deputy, railway-contractor, and ironmaster, son of a Jewish banker at Bordeaux; in "Nana" he portrayed a German Jew named Steiner, whom he represented as amassing millions by his acumen and as squandering them in gross dissipation until he was at last completely ruined by the woman whose name furnishes the title of the book; and in "L'Argent" (1890-91) he introduced various Jewish characters, such as bankers, stock-jobbers, and speculators. But it should be said that if Zola placed various bitter diatribes in the mouths of some of the Jewhaters figuring in the last-named novel, this was simply because his subject required it, the diatribes in question being in no sense representative of the author's personal sentiments. "For some years I have been following with increasing surprise and disgust the campaign which some people are trying to carry on in France against the Jews. This seems to me monstrous, by which I mean something foreign to all common sense, truth, and justice, something blind and foolish, which would carry us back several centuries, and which would end in the worst of abominations, religious persecution. . . ."
In this article Zola dealt with anti-Semitism from a general point of view, making no mention of Captain Dreyfus, the agitation for whose release had not yet begun. At a later date, when Zola had espoused the cause of the unfortunate prisoner, he frequently referred to the general question of anti-Semitism, which he denounced as odious and foolish, both in his articles "M. Scheurer-Kestner," "Le Syndicat," and "Procès Verbal," published in "Le Figaro" in the autumn of 1897, and in his subsequent pamphlets "Lettre aux Jeunes Hommes" and "Lettre à la France." His adversaries thereupon accused him of venality, asserting that he had been bought by the Jews. When his active participation in the Dreyfus case had ceased, he chose the affair as the subject of what was destined to be his last novel, "Vérité," largely transferring the action, however, from military spheres to the teaching world, in such wise that in his pages Captain Alfred Dreyfus became a French provincial schoolmaster called Simon, with a brother named David (M. Mathieu Dreyfus), while the notorious Major Esterhazy was transformed into a certain Brother Gorgias. Other Jewish characters figured in the volume; for instance, Simon's wife, Rachel (Mme. Alfred Dreyfus); their children Joseph and Sarah; the Lehmanns, a family of penurious Jewish tailors; and Baron Nathan and his daughter Lia, who became a Catholic, like Eve in "Paris," and married a violent anti-Semite, the Count de Sanglebœuf. Nathan is not described as having formally renounced the Jewish faith, but Zola treats him as a renegade, one of those who, having risen to affluence and rank, not only cast off the ancestral traditions, but even join the persecutors of their race. From first to last "Vérité" is a vigorous denunciation of anti-Semitism in its various forms, its growth and diffusion in France being chiefly attributed by Zola to the action of the Roman Catholic priesthood. The writing of the book was only just finished when Zola died by accidental suffocation. Sincere regret for his death was expressed by Jewish communities all over the world, for they recognized that they had lost an able and perfectly disinterested friend in the deceased writer. A considerable part of the large sum of money subsequently raised for the erection of a monument to him in Paris was contributed by Jewish subscribers, several of whom had previously given liberally when a superb gold medal was struck in his honor. idem, La Vérité en Marche, ib. 1901 (in the last-named volume will be found the various articles, letters, and addresses written by Zola in connection with the Dreyfus case; of some of these there is an English translation, Zola's Letters to France, with introduction, by L. F. Austin, New York and London, n. d.). On Zola's attitude toward the Jews: Ernest Vizetelly, Emile Zola, Novelist and Reformer, New York and London, 1904.